Every January we have the great privilege of announcing FBG’s Employee of the Year. Each of our six district offices nominates one of their star employees and we have the daunting task of selecting one of those deserving nominees for the honor. Making the choice this year was difficult, but we selected a Team Member who consistently demonstrates exemplary character, performance and overall excellence; an individual who truly embodies FBG’s values and mission: Omaha District’s Larry Owen. 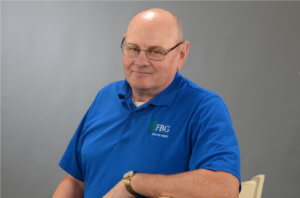 Larry personifies the FBG culture: He’s friendly, hard-working, honest and fair. He makes a conscious effort to look out for the best interest of our customers and FBG every day. Larry started as a Cleaning Specialist in 2009, became a Site Supervisor in 2015 and an Operations Supervisor in 2018. His expertise in the cleaning business makes him a valuable asset to our team. One of Larry’s most valued strengths is his integrity, evidenced by his words and actions with his peers, employees and customers. He’s an honest man doing an honest day’s work. He proved his loyalty to FBG when the account to which he was assigned ended in 2013 and he graciously resumed his retirement. In August of 2015, an opportunity to return to FBG presented itself and he didn’t hesitate to rejoin the team. We are so happy he did! “Larry is a very high caliber individual who exemplifies, in all aspects, what being a true team player means. He is precise in his communication and we all appreciate his daily efforts to deliver a quality level of service to our customers,” Vice President Andy Petersen said. Larry works at some of our more rural accounts and doesn’t always have the resources he needs at his fingertips. So, he uses common sense, problem solving and even old-fashioned elbow grease to get things done. He makes sure the customer is satisfied and ensures the safety of employees. Never one to take life too seriously, Larry brings a sense of well-being to his team with humility, respectfulness and kindness. He inherently teaches the values of hard work, ethics and pride, and truly leads by example. He shares his knowledge with others when training and believes that two heads are better than one when it comes to problem solving. He completes his paperwork on time and correctly, all while carefully monitoring expenses. A devoted husband and father, Larry is also a Veteran of the US Army and an outstanding citizen in his community. When he isn’t at work, at church, volunteering, or getting kids where they need to go, he enjoys spending time with his family and golfing. Larry is caring, compassionate, and an active listener—truly a genuine person and our choice for FBG’s 2018 Employee of the Year. On behalf of everyone at FBG, thank you, Larry, and congratulations!